See the image in context at The New York Times. Fortune magazine gathered a few user experience designers and asked them to prototype some revisions to Facebook’s privacy settings. Fortune made a gallery of a dozen samples, consisting of a brief description for each sample. While the gallery could have been a bit more robust, the teaser-style images certainly provide some interesting perspectives on how to minimize the massive confusion the current Facebook privacy screens create. Simple suggestions include embedding the privacy options inline with the items to control, and showing numbers next to grouping options (how many users does “friends of friends” encompass?). A couple samples are below. The biggest message we have heard recently is that people want easier control over their information. Simply put, many of you thought our controls were too complex. […] In the coming weeks, we will add privacy controls that are much simpler to use. The column goes into more detail on the overall privacy debacle, but I’ll leave that up to you to read, I’m just looking at the UI options today. Whether or not anything we see in the sample UIs will make its way into the screens on Facebook is anybody’s guess, but from the column, we should know in a few weeks. Facebook and Privacy: What a Mess at PC World. How Facebook Is Redefining Privacy at Time Magazine. Facebook, MySpace Confront Privacy Loophole at The Wall Street Journal. 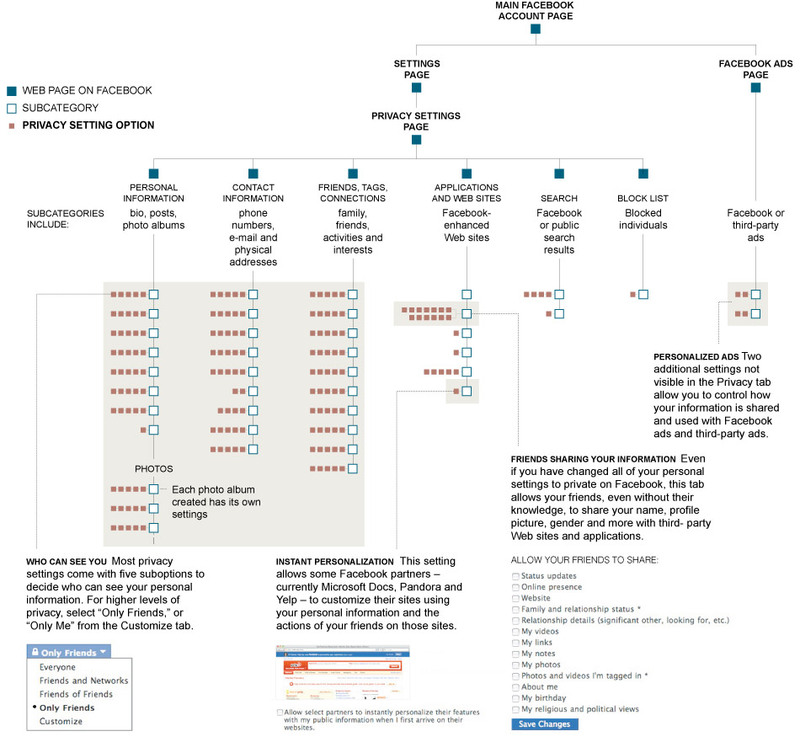 Facebook Open Graph: What it Means for Privacy at Mashable. Price of Facebook Privacy? Start Clicking at The New York Times. Update (May 25): Mashable reports New Facebook Privacy Controls Arrive on Wednesday. That’s tomorrow for those not near a calendar. Update (May 26): It’s Wednesday, and no new privacy controls. Although Facebook did announce them, show a screen shot, and say they’d be coming in the next few weeks. Mashable reports BREAKING: Facebook Announces New Privacy Features.